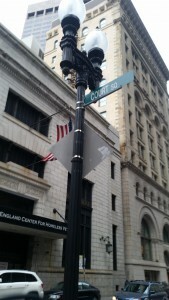 This is the address where James Franklin first published the ‘New-England Courant’. This was also the print shop where Benjamin Franklin was first introduced to the printing press. 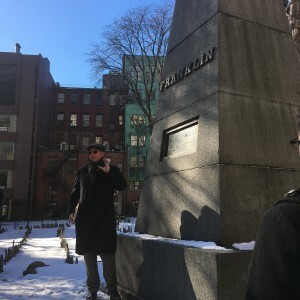 The site is less than 500 feet from the site of the Boston Massacre, and just down the street from Benjamin’s birthplace. 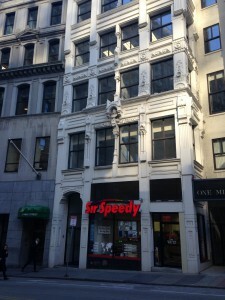 This is a picture of the Old South Meeting House on Milk Street. The meeting house played an important role in early American colonial history, as it was the original meeting point for those organizing the Boston Tea Party in December of 1773. This site relates to Benjamin Franklin as he was baptized in the Old South Meeting House, as it was a Church during the 1700s and 1800s, before it became a museum in the late 1800s. Across the street from the Meeting House was where Franklin was born. Benjamin Franklin erected this obelisk at his parents’ burial site to commemorate their lives and achievements. While his father was simply a soap-maker and his mother was a colonial housewife with a large hoard of children, they led a successful, accomplished life, as did all their children after them. Franklin’s parents were a prime example of hardworking Americans managing to provide for their children and contribute to their community, accumulating respect and a good family reputation, despite coming from little status and no affluence. Franklin surely wished for them to be thought of and remembered as such, and this grand monument to them was intended to remind the public of their achievements and the ideals they represented. 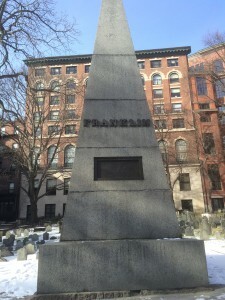 Their grave marker is the most prominent in the Burying Ground, larger than those of Paul Revere, Samuel Adams, or John Hancock; such is, in and of itself, a testament to the essentialism of hard work and dedication, as well as how highly Franklin valued such ideals. 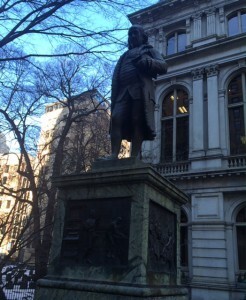 This statue of Franklin is located on the Freedom trail, on Milk Street. 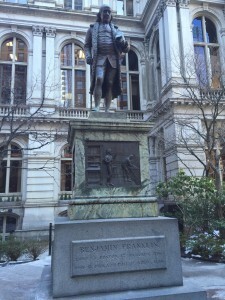 It depicts Boston native Franklin, in front of the old Massachusetts State house. 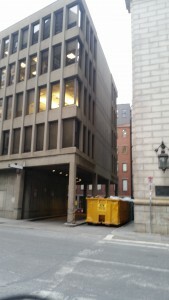 This was the site of the first Boston Latin school. Franklin was a prodigy, and from a young age his intelligence was apparent. His family sent him to learn here so he could go on to go to college. He excelled and ended up at the front of the classroom in only his first year. He unfortunately was pulled out so that he could work for his very large family. However, this one year of education was obviously enough, because the bottom of the statue depicts his brilliance in diplomacy, politics, and science, with important scenes from his life in all of those fields. And distrust not Providence.”. The inscription tells readers that if they work hard then God will treat them well in the future. The Benjamin Franklin statue, located at the old Boston City Hall, was constructed by Richard Greenough in 1856 and was the city’s first public statue of a person. The statue is located along School Street and overlooks the former site of the Boston Latin School, where Franklin actually once attended. The statue was constructed with four bronze panels around its base in order to depict Franklin’s most significant accomplishments; such as being a printer, a scientist, being present at the Declaration of Independence, and at the signing of the Treaty of Paris. When you get closer to these bottom panels, you will be able to see detailed pictures of all four of these events in Franklin’s life carved into the bronze. 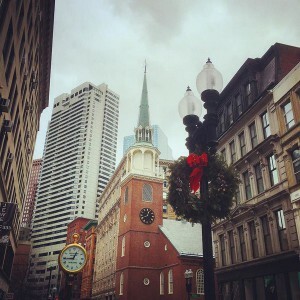 The statue has become a popular and famous tourist attraction for the city of Boston, due to the fact that it is located along the popular Freedom Trail. When examining the statue in person, it is amazing how detailed the images on the four panels are, considering they were carved out of bronze about one-hundred sixty years ago. By taking the time to actually read and absorb the information on the statue, a person can learn a great deal about some of the most important times in Benjamin Franklin’s life. I could not tell you the countless number of times that I have walked by one milk street and had no idea that one of America’s most influential individuals was born at this location in 1706. Although the image you see is not his original building of his birthplace due to the fact it burned down in the 1811 it is still pretty cool to think such an enlightened person was born there. 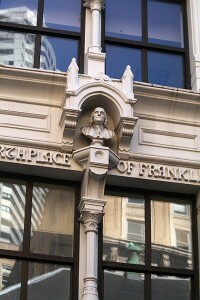 If you pass by One milk street you will see a statue of Benjamin Franklins head stating “Birthplace of Franklin”. 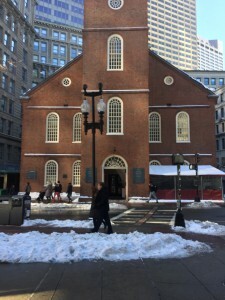 Beginning in 1729, the Old South Meeting House served as a Puritan house of worship where American leaders such as Benjamin Franklin regularly attended meetings. Being the largest building in Boston at the time, the house would become a forum for dissent and free speech. In regards to the building’s significance, it served as a meeting place for the debate that ignited the Boston Tea Party. Benjamin Franklin was born here on Milk Street in Boston, Massachusetts on January 17, 1706 to Josiah Franklin and Abiah Folger. His was the youngest son of seventeen children and lived in Boston for all of his childhood and the majority of his teenage years. This building is not the original home of Benjamin Franklin, as the original burned down in a fire that swept down Milk Street in 1811. Ironically, the ground floor is home to Sir Speedy, a printing company. It is a different kind of printing, but it is ironic that the spiritual successor of one of Benjamin Franklin’s occupations is where his birthplace is. Franklin’s time in Boston helped shaped his character and set him on the path of becoming what many in his time referred to him as, The First American. 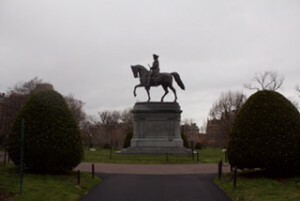 This equestrian statue of George Washington, located in the Boston Public Garden, was sculpted by Thomas Ball in the 1850’s. Later, in 1869, the statue was unveiled before the public with a thirteen-gun salute and is remembered as a time of intense local pride. Shortly before this, in 1856, the statue of Benjamin Franklin in front of Old City Hall on School St. graced the public. Two of the 18th century’s greatest historical contributors and figures in the shaping of our Nation commemorated in stone right int he heart of Boston. Like Washington, Benjamin Franklin was among the few of the signees of the Declaration of Independence and stands as a major contributor in American history to the political and scientific discoveries made in the 18th century.